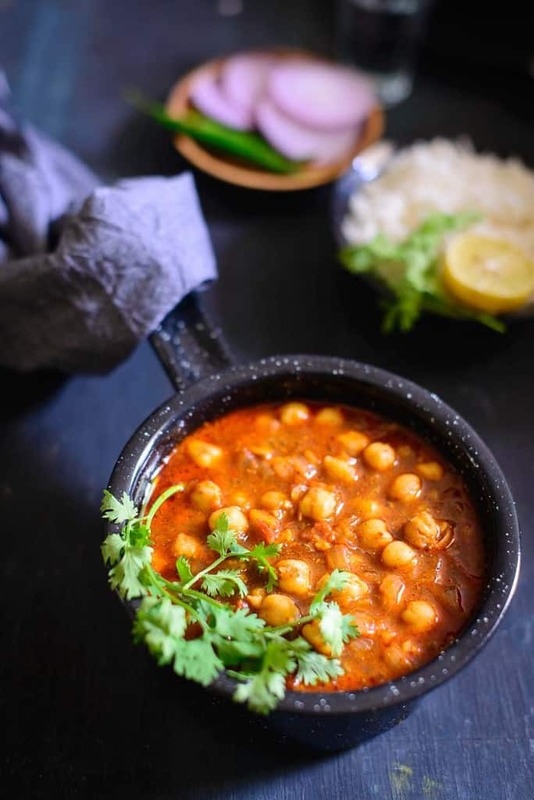 Achari chole is a delicious Chickpea curry made using pickling spices. 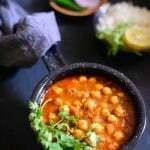 Here is a simple and easy to make recipe to make Achari chole. Achari Chole or chickpeas cooked along with pickling spices is a regular curry at home. Will Achari masala ready at hand, it hardly takes any extra effort to make this dish. The key to make a good Achari curry is to make the masala at home using the best of ingredients which gives a bold flavor to the curry. This curry goes very well with any Indian bread or steamed rice. Wash the chickpeas and soak them in enough water for 6-8 hours. Add the chickpeas in a pressure cooker with 3 cups of water and 2 tsp salt. Pressure cook till chickpeas are soft. Remove the pressure cooker from heat and keep aside. Dry roast the ingredients to make Achari masala in a pan till slightly browned and fragrant. Cool and grind to make a coarse powder. When the oil is hot, add onions and fry till onions are pinkish. Add ginger garlic paste and fry till onions are golden brown in color. Add the achari masala, roasted cumin powder, amchoor powder and Kashmiri red chili powder. Fry the masala for about 2 minutes, till oil starts to come on the sides of the pan. Add the cooked chickpeas along with the water in the masala. Cook for 10-15 minutes on low heat. Serve hot with Parathas or naan. Do give it a try Meg. I am sure you will love it.